You’re first eligible to sign up for Medicare during a seven-month period that begins three months before you turn sixty-five and continues until four months after your sixty-fifth birthday. To avoid permanent penalties to your Medicare Part B and Part D premiums, you need to sign up on time, and not miss this important window of opportunity. What happens if you continue to work after age 65? If you are still working after age sixty-five, you can still sign up within eight months after you separate from service, or the group health plan, and you won’t be subject to penalties. When is the best time to purchase a Medigap policy? When you turn 65 is the best time to also purchase a Medigap policy (aka Medicare Supplement policy). A Medigap policy will cover some of the costs not covered by original Medicare. When you do purchase your Medigap policy during a six-month period, which begins when you are sixty-five or older and enrolled in Medicare Part B, you’ll be guaranteed coverage because insurance companies will not be allowed to issue your coverage via health underwriting. You’ll be able to secure coverage regardless of any pre-existing health condition you might have. However, if you enroll in Medigap AFTER this initial enrollment period ends, Medigap insurance companies can legally charge you higher premiums, or even deny coverage due to pre-existing health conditions. 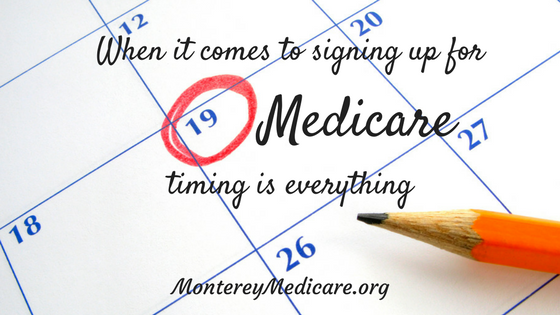 The bottom line is that when it comes to signing up for Medicare, timing is everything. Obviously, there are a lot more factors to consider when it comes to your personal situation. The best way to ensure that you don't make a costly mistake when signing up, is to speak to a licensed healthcare professional who specializes in Medicare. If you have questions, which I'm sure you do, please feel free to reach out to me and I will get back to you right away. There is no cost or obligation to get a quote or answers to your questions. My process is simple and aimed at educating you, not pressuring you. I'm here to educate, guide and advocate for you when it comes to Medicare insurance coverage.